The marine GPS chartplotter has become vastly populated with a range of system available. These include small 5 inch displays to interactive 24 inch screens with a variety of features to play around with and suited to different types of boating. The best marine GPS chartplotter is the Lowrance HDS9 GEN3, which features a touchscreen display, wireless connectivity and advanced CHIRP and sonar scanning. In terms of the different types of marine chartplotters available, they can be dedicated to certain types of boating. These include coastal power cruising, coastal sail cruising, racing, sport fishing and much more. The majority of marine GPS chartplotters feature a range of additional features. These include fish finders GPS combos, along with wireless connectivity for saving and sharing your data over smartphones. However, depending upon on the budget that you have set aside will decide on the amount of features that your device will have. The display is the main feature and come in a range of sizes, resolutions and touchscreen functionalities. The latest chartplotters mostly all have touchscreen functionality and this has transformed the way in which we use these devices today. For large vessels, these devices are an essential and allow you to navigate with confidence. Below is a list fo the best marine GPS chartplotters that provide precision chartplotting and a range of other features. The Lowrance HDS9 GEN 3 is one for those looking for the ultimate chartplotter that is enriched with a variety of other features. It uses a 9 inch LCD multi-function display and an enhanced processor for the ultimate experience. It is the latest marine GPS chartplotter produced by Lowrance with all the cutting edge technology. The lowrance HDS9 Gen 3 even has the ability to control a trolling motor, outboard motor and the entire electronic system of your boat. The data sensors for the professional level system are simple to install without any excessive modifications required. For those that want to save their map data, the Lowrance software allows you to control into a cloud enabled experience and a range of fishing apps. Overall, it is the best marine GPS chartplotter that you can buy with the only drawback being the price of the device. Garmin is a brand that needs no introduction and the 1040XS model is a keyed chartplotter and sonar combo that uses a 10 inch display for feedback. However, the display is only a SVGA unlike the LCD screen of the Lowrance above. In terms of compatibility with other devices, you are able to connect your Garmin chartplotter with iOS and android devices. Using the application, you are able to record your chartplotter in action and share with friends. Overall, it is the best Garmin GPS chartplotter for the money and almost half the price of the Lowrance. However, the SVGA display may be an issue for some looking for crips clear graphics from the display. 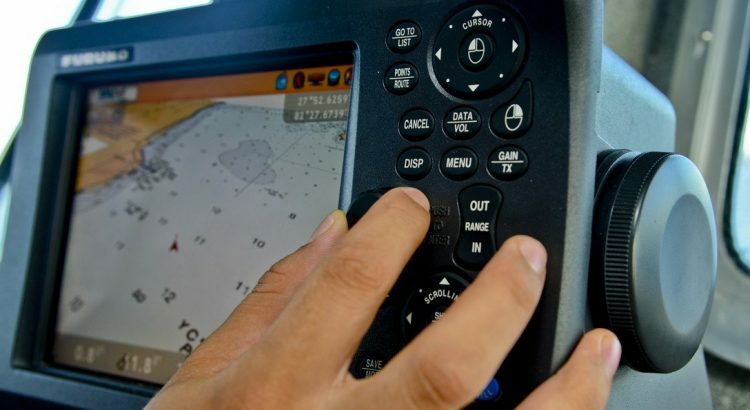 The Simrad GO7 XSE uses an elegant touchscreen display that has a built-in GPS receiver and WiFi connectivity, which allows you to get the latest charts and updates. The touchscreen interface makes navigation fairly straightforward as its very much similar to that of a smartphone. For example, simply tapping the functionality you want and moving around the charts is far easier. The user interface is not only intuitive but its also offers a vast amount of customizability, with the likes of shortcuts and you can even add your own wallpaper. Navigation is another major feature of this GPS chartplotter and it does this effectively with the waypoint management system. You can set and record your preferred destination and it will allow you to navigate with confidence. Overall, the Simrad GO7 XSE is one of the most popular marine GPS chartplotters. This is primarily due to the low cost of the device and the impressive technologies integrated into the device. The intuitive touchscreen display is by far the best feature and makes using a chartplotter far easier. For those looking for a sailing chartplotter, then the Echomap Chirp 44Cv is one with buit-in maps and charts and is another device by the reputable Garmin brand. The charts themselves include the majority of the US coastlines and the Canadian side of the Great Lakes. The Chirp sonar is one of Garmin’s most sophisticated and designed to provide better target separation and solid definition. It will also record the timing of the boats positions along with the sonar return. It can then be analyzed later from a range of devices that can read the digital data, which can be saved on a SD card. Overall, the Echomap Chirp 44Cv by Garmin is the best marine GPS chartplotter for the money and is a fraction of the cost of the alternatives. Hummingbird is the most popular marine GPS chartplotter on the market and one of the cheapest too. It features a 800 x 480 5 inch display with a backlight and micro SD card slot for saving of waypoints and adding optional maps. The Hummingbird imaging sonar and mapmaking power of the Auto Chart Live are the desirable features. Considering that its an affordable marine GPS chartplotter, it certainly matches the advanced features of the expensive alternatives. For any avid boater, a marine GPS chartplotter is an essential tool that you need to have on your boat. A GPS chartplotter helps you plan a safe course to follow while you’re out on the water. When selecting a GPS chartplotter, there are many things to consider. Chartplotters have become very advanced over the past several years, with a variety of unique features. Here’s what to look at when shopping for a GPS chartplotter. The most important thing to consider when shopping for your marine GPS device is what kind of navigation data it can give you. Many devices nowadays are able to connect into a larger database to display location data. They will also connect to sensors that are placed elsewhere on the boat to provide a variety of other metrics. Many devices now even offer an autopilot function, which is very helpful for plotting charts quickly. However, it’s important that the software stay updated for the device to function at its best. Some smaller chartplotters do require location data to be put in manually, so it’s important to check this before you make a purchase. If you want to use your chartplotter for racing, it’s helpful to have a device that’s designed with this in mind. Many GPS devices now come with racing specific features to help you keep track of your time and speed while out on the water. They also have wind calculation tools to help you make smarter decisions and move faster in the water. Alternatively, if you’re not interested in racing, you may not need a chartplotter with all these bells and whistles, and would instead want to look for something simpler that suits your needs. If you are an avid fisher, you will want to look for a chartplotter that has handy features to help you fish successfully. Many chartplotters now come with sonar and other fish-finding tools, which are incredibly useful, particularly for professional fishermen. Some options even allow you to draw customized seabed maps to help you locate and relocate your favorite fishing spots. Many popular brands of marine GPS tools now offer at least one option that’s designed for fishing. It’s important to note that sonar features can be very costly and complex to install, so they’re not for the faint of heart. Chartplotters come in many different sizes now, and it’s helpful to have a large chartplotter so you can see all the relevant navigational details up close. A bigger screen allows for better functionality, so you’ll be able to really make the most out of the device. You’ll also want to consider how much brightness the screen offers, since you’ll likely be using it at night or in dim spaces at least some of the time. A bright, colorful screen is most useful for navigational purposes. The overall design of the GPS chartplotter is a big consideration when making your purchase. Many chartplotters now have a touchscreen option, which is very intuitive to use. However, touchscreens can be difficult to use when dealing with the elements, as they don’t always work well in damp or salty environments. Alternatively, buttons are more reliable than a touchscreen, but they’re not necessarily the most intuitive, and they can take longer to use than a touchscreen. Devices with buttons usually have a smaller screen as well. Which option you go for will really depend on your personal preference. Another very useful feature to look for in a marine chartplotter is the ability to connect to other devices, such as your smartphone or smart watch. Many chartplotters now offer apps that you can use to access data from your mobile phone. Some chartplotters also come with handheld mobile devices that you can take with you to control the system as you move around. Many chartplotters also offer wifi connectivity, which allows you to access a variety of helpful online services. For example, these devices can now connect to live weather updates as well as location data from other boats, so you can stay more informed while you’re out on the water. This is an extremely helpful feature to look for when shopping for a chartplotter. Chartplotters have become incredibly complex over the past several years, offering an increased number of useful features that offer more detailed navigation. However, these added features can make the chartplotter difficult to install. If you are sailing a small ship without complex navigation needs, this may not be the best fit for your needs. When shopping, it’s helpful to consider how much extra wiring you’ll need to do to install the GPS module, as well as any accessories or sensors you’ll need. If you can, it may also be helpful to test out a demo of the GPS device in store to determine how intuitive it is. Casual sailors may not need the full range of features that an advanced chartplotter can offer, and instead should opt for something that’s simple to learn and easy to use on a regular basis. Small handheld units may be the best way to go for casual sailors, because you can start using them quickly with only a small learning curve. Even for more advanced sailors, it’s still important that the controls are manageable, because otherwise you’ll spend more time trying to figure out what all the metrics mean instead of getting helpful information out of it. There’s so much to consider when buying a marine GPS chartplotter, so it’s important to really take your time when shopping and look at all the relevant features before making a decision. If you can, it’s very helpful to go into a boating store to look at the devices. Many of them offer demos so you can see how they work and if they would be a good fit for your personal needs. Finding the right chartplotter is often exactly what you need to do more with your boat, whether you’re a casual sailor or a serious sportsman. 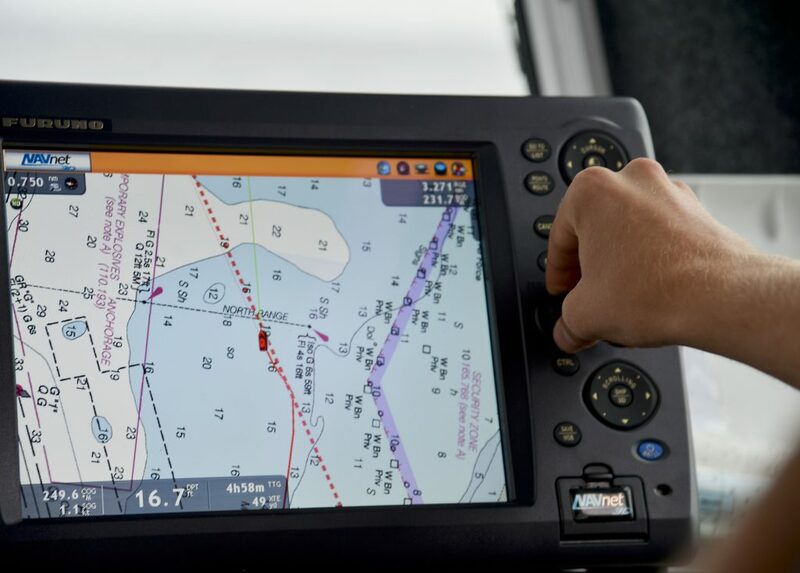 A marine GPS chartplotter allows you navigate your vessel with confidence with the advanced sonar and waypoint technologies. They are expensive devices but once you have used one once, you will always be looking to upgrade to the latest. All of our recommendations within this article cover a high and low budget with a range of features suitable to certain types of boating.